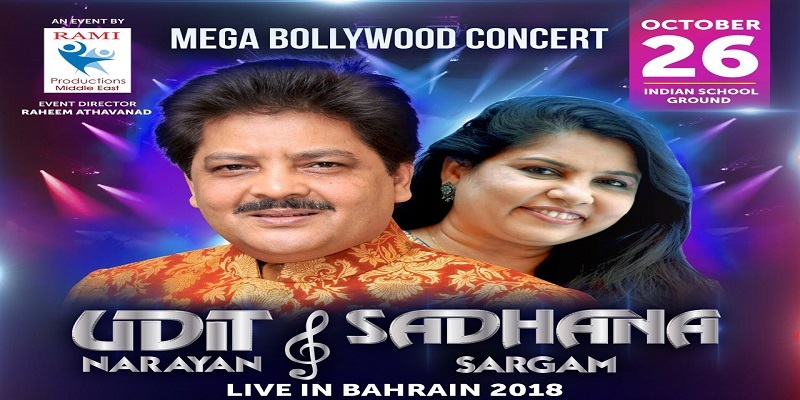 Stay tuned for upcoming events for Udit Narayan and Sadhana Sargam Live in Bahrain 2018 in near future. RAMI PRODUCTIONS brings you a true delight of music this october...We proudly bring you THE KING OF MELODY "Udit Narayan" & "Sadhana Sargam"..Mark your calenders and join us on October 26,2018 to witness the live performance of the evergreen hitmakers! Rami Production has been able to establish in Middle East for more than 15 years with Different shows that are a successful experience for both our attendees and supporters with a good track record of providing exceptional entertainment and creative events in Middle East. Terms & Conditions : All Rights are Reserved by Organizer. Copyright © 2015-2019 - eTicketing.me. All rights are reserved. Best Viewed at 1024 x 768 pixels and above. This Page loaded in 0.04904 seconds on Wed, Apr 24, 2019 (21:03).